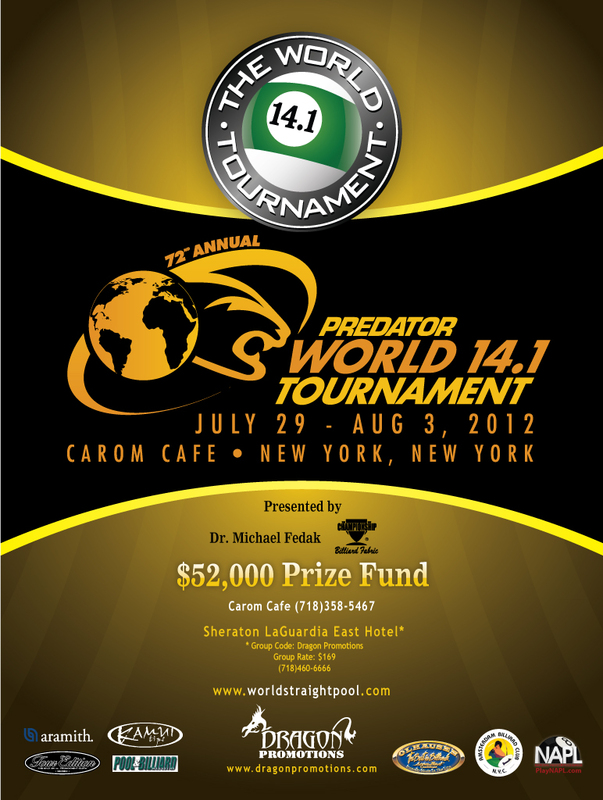 Carom Cafe in conjunction with Dragon Promotions and HighRock Productions, is proud to present "Billiards Heaven in New York": Sure to be a transcendental experience; imagine, for the very first time, simultaneous Championships in the two finest billiard disciplines, performed at the ultimate levels: Predator World 14.1 Tournament and the Verhoeven Open 3-cushion Tournament - together, in one amazing venue. "The theme of this weeklong extravaganza of world-class pool and carom is the convergence of billiard disciplines. 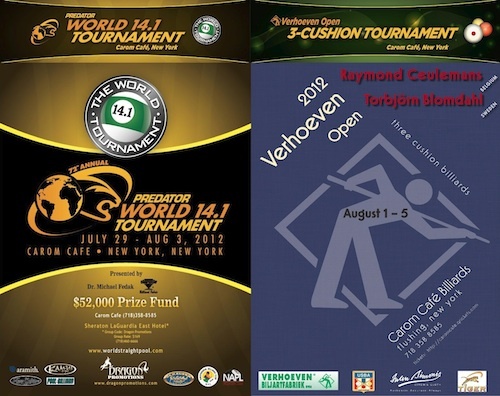 For whatever reason, the two billiard worlds have diverged over the years, and I think that a great way to bring the two spheres back together is to showcase the most excellent players of the two greatest games simultaneously here, at Carom Cafe; The Predator World 14.1 and the Verhoeven Open 3-Cushion events held closely together will certainly accomplish this. ", says Michael Kang, owner of Carom Cafe. After the world-class pool and carom competitions are over, a rare interdisciplinary exhibition of the great masters will be presented. Efren Reyes is known for his uncanny cue ball control, but few pool players trace this to his deep training in carom. Meanwhile, most carom players are totally unaware about Torbjorn Blomdahl's abilities in the pocket games. Sir Raymond Ceulemans and Efren Reyes will demonstrate a beautiful game called balkline. In actuality, there is a significant overlap between the disciplines, as evidenced by the skill sets at the very top. The complete player brings together all of the billiard skills whenever they step to the table. 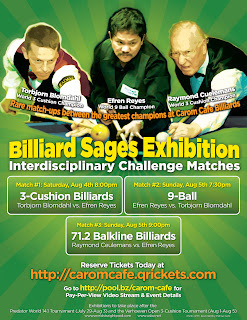 "I hope that this summer's event at Carom Cafe will be a catalyst for cross-pollinating interest across all cue games. ", says Ira Lee of HighRock Productions, who is producing the stream. Do not miss this weeklong extravaganza July 29 - Aug 5 which combines the splendor and brilliance of BOTH pool and billiards, played by the greatest billiard virtuosos, from all over the globe, as they compete for coveted titles in the highest forms of the billiard games. No serious fan of billiards wants to miss "Billiards Heaven in New York" - come witness the absolute pinnacle of billiards achievement at Carom Cafe this summer. If you cannot come, catch it online. For the seventh consecutive year, Dragon Promotions will produce the biggest international 14.1 event in the world, The 72nd World Tournament of Straight Pool . 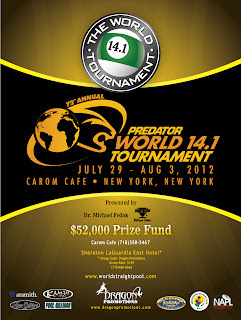 Once again in partnership with the support of Dr.Michael Fedak, this year's event will for the first in decades move to New York to Carom Cafe in Queens. The well renown billiard room will host this year's event starting July 29 through August 3, 2012. Once again the greatest straight pool players from around the world will arrive on USA soil and attend this prestigious event to play for the coveted title of greatest straight pool player in the world. Finally we are in New York City! Ever since the first year we resurrected the World Tournament, New Yorkers have been literally begging us to move it there. They promised big crowds, so here we are seven years later. This is the closest we have also ever been to Manhattan, so we are only a few stops on the subway to Queens and Carom Cafe", said Cindy Lee, CEO of Dragon Promotions. The World Tournament is the oldest tournament in history that still exists today. Invented by Jerome Keough and shortly after recognized as the official game of billiards. The first World 14.1 Tournament was held in 1911 and won by Alfredo DeOro. In its history due to war and economics, theWorld Championships had 29 tournaments that did not take place including a 15 year gap between 1990-2005 until Dragon Promotions revived the game and the World Tournament in 2006. "This is my absolute favorite game, and this is my favorite event in the world. The World Tournament is the ultimate straight pool event, and the oldest testament of skill there is in pool. Dragon Promotions have been terrific caretakers of this prestigious championship, and I am pleased to help them continue the longest running tournament in history", said Dr.Michael Fedak, one of the event's main sponsors. This year's event will feature players such as Johnny Archer, Thorsten Hohmann, Darren Appleton, Mika Immonen, John Schmidt, Efren Reyes, Allen Hopkins, Stephan Cohen, Charlie Williams and many, many more. The Verhoeven Open 3-Cushion Tournament will be held between August 1 through August 5, 2012: featuring two living legends in the game, Raymond Ceulemans and Torbjorn Blomdahl. Sir Raymond Ceulemans is a living carom billiard legend. He holds 35 World Championship titles in every carom discipline and has won over 140 titles in his long and illustrious career. Blomdahl is also a living legend in 3-cushion billiards - many times World Champion and the top-ranked player on the Worldcup ranking list in 2011. The strong field includes World Junior Champion, Glenn Hofman, World Artistic World Champion Roberto Rojas, 5x US National Champion Pedro Piedrabuena, 2x US National Champion Hugo Patino, past US Champions Jae Hyung Cho, Sonny Cho, Mazin Shooni, and Miguel Torres, Mexican Champion Luis Avila, and many others. Don't miss this chance to see the greatest 3-cushion players from all over the world compete for the title at Carom Cafe. Over the final weekend, Efren Reyes and Torbjorn Blomdahl will "lock horns" in a dual-discipline 9-ball/3-cushion challenge (Aug 4-5). Each player will attempt to secure an expected win in their respective specialty while upsetting the other in their own game. Years ago, Reyes and Blomdahl played a similar interdisciplinary exhibition (in Japan on YouTube) and Blomdahl won both the 3-cushion and the 9-ball portions of the contest. Efren Reyes seeks his revenge in front his NY pool fans. 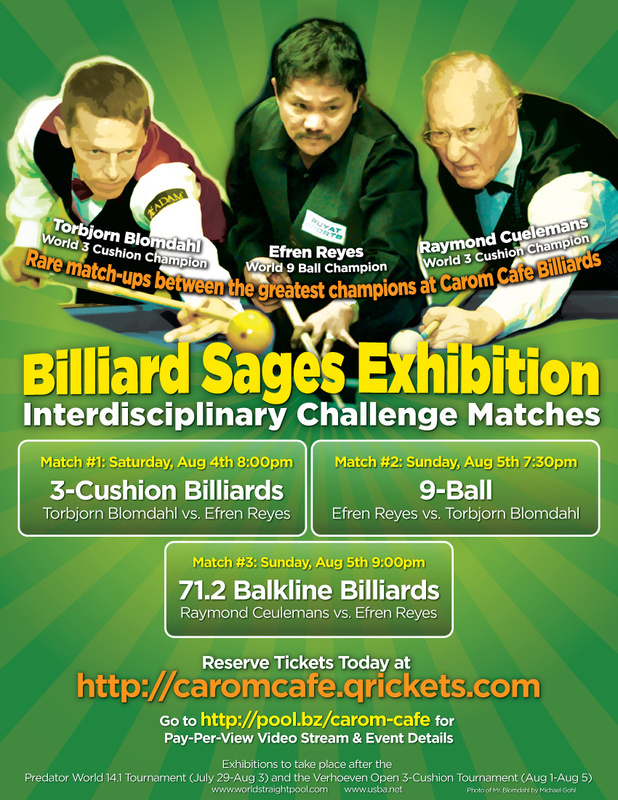 The grand finale to conclude the week will be a rare balkline exhibition match between the two great pillars of the pool and carom worlds: Efren Reyes and Raymond Ceulemans. 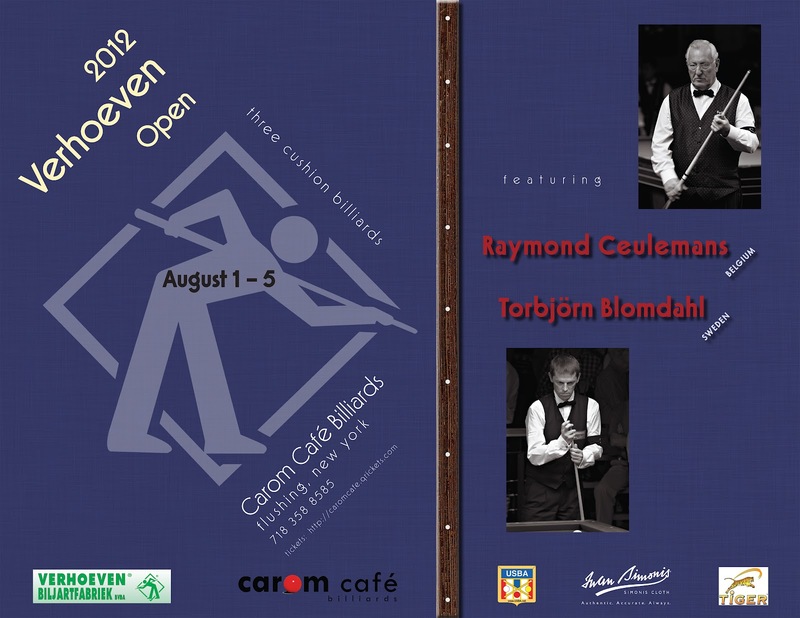 Sir Raymond Ceulemans is the greatest carom billiard player of all time. Numerous fellow professional players have credited Reyes with being the greatest living pool player in the world. Many pool players will be surprised to learn that one of the finest pool player's (Efren Reyes), favorite game is not 9-ball, 8-ball or even 1-pocket; but balkline*. Special thanks to Jim Shovak, Noel Mendoza, Michael Shamos, Michael Bray, Bob Jewett, Victor Stein, Robert Byrne for bringing us this exhibition.